Here in the Bay Area, we’re blessed with enviable natural beauty, and we love to take advantage of it by hiking all around trails that wind through gorgeous landscapes and seascapes. Unfortunately for dog owners, access to some of these great hikes is restricted because of leash laws, and off-leash options are few. In fact, you can start a great hike in Marin that allows dogs (on leash), but because the trail crosses from county to state park to national park to water district lands and back again, you might find yourself suddenly on a stretch that isn’t canine-friendly at all. But one mile later, you and Fido are on safe ground again. On top of that, you have environmental threats – ticks in Marin, rattlesnakes on the peninsula, heat exhaustion in the East Bay, poison oak everywhere. Very literally, pick your poison. What dog-owners look for and have a hard time finding are dog-legal hikes interesting for both human and canine and that don’t require a lot of doggy management (e.g. ticks, poorly maintained trails with hard to avoid poison oak, blistering sun without cover, etc.). Sometimes we want to spend all day on the hiking adventure, but sometimes we just want to give it a morning. This creates a complex Venn diagram with a very narrow ultimate overlap section. And frankly, it can take a lot of research – between word of mouth, online searches and studying various trail books – to find good long, interesting, dog-friendly hikes. But all is not lost! This is Northern California after all, with endless trails – some a hop, skip, and a bridge away; some tucked in the middle of suburbia. If you’re new to hiking with a pooch around here, start with one of these doggy-friendliest hikes from around the Bay – including all-day adventures that take you far afield, to more easily accessible jaunts almost in your backyard, and all with great views. Dogs are allowed on all these trails, but check for specific leash laws. The Bolinas Ridge Trail near Point Reyes offers a two- to 20-mile hike (out and back) with spectacular views of Point Reyes and Tomales Bay. Pick up the trail on Sir Francis Drake Boulevard, just before you hit Olema, and head south until you’re tired, or hit the Bolinas-Fairfax Road, then turn around. When you’re back to the car, mosey up to the teeny tiny towns of Olema or Point Reyes Station for great food (Marin Sun Farm Café, Bovine Bakery, Tomales Bay Foods with Cowgirl Creamery, … yum! ), and rest your paws with a picnic and people watching (weekends attract all kinds of bicyclists in fancy spandex). Wildcat Canyon, tucked behind scenic East Richmond Heights and San Pablo, looks like it goes on forever. Take the intersecting series of trails for a six- to eight-mile loop. Wildcat Creek Trail to Belgium Trail to San Pablo Ridge (and then onward where ever you fancy) guarantees views that get better and better with each rolling hill until you see from the Bay Bridge to north of Mt. Tamalpais. After a chug up a pretty major incline, you’re rewarded with views north almost to Benicia. A tip on finding the right entrance: Don’t go to the Tilden side, which does not allow dogs at all. You want to go to the northwest entrance on Park Street. When you turn onto Park Street, go past what looks like the obvious entrance (this path will take you to a ton of picnic tables and play areas for kids) and continue up the street to the Alvarado Staging Area. This entrance takes you to a parking lot and the Wildcat Creek trailhead. Sweeney Ridge is part of the Golden Gate Parks Conservancy, and you can access the trail from a two different trailheads, depending on your mood. Want an easy, mostly paved hill to the Nike Missile site? Enter from the west on Sneath Lane off of Highway 280. Head south at the restroom to Portola Gate (nothing special but a nice walk) before you turn north to the missile site. After you check out the remnants of missile control, which is mostly covered in graffiti, continue north to Mori Trail, which cuts west and drops down to the ocean (it’s a long way down and a steep, loose descent, but tempting if you have the time), or savor the view and then head back whence you came. 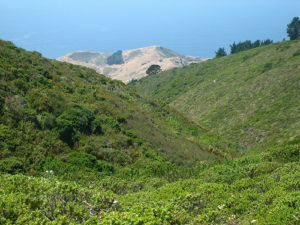 Alternatively, if you’re looking to punish your glutes, start Sweeney Ridge Trail from the north at Skyline College and climb a veritable stairway to heaven – if the fog is thick, you’ll think you’ve accidentally ascended straight into the clouds; if it’s a clear day, the views of the Pacific Ocean to Mt. Tamalpais are ethereal. After you catch your breath at the top, continue south to the Nike Missile site (and onward to Portola Gate) turn around for a lovely downhill return. (Oh, you can still catch Mori Trail from this side – just hang a right when you crest the top of Sweeney Ridge – and you can easily spend the rest of the day on your couch without any guilt). High above Los Gatos in the Sierra Azul Open Space Preserve, the Kennedy-Limekiln-Priest Rock trails connect for a thoroughly enjoyable loop that offers sweet views to the Bay. You can enter the Sierra Azul area a few different ways. I prefer to skip the Lexington Reservoir trailhead and start off of Kennedy Road on the Kennedy Trail. It may just be my imagination, but this feels less congested and the mountain bikers seem more accommodating. If you complete the full loop, it’s several miles (13.8 according to the map) , which makes it worth the trek for a daylong getaway from the north and east sides of the bay. Then you can pop into picturesque Los Gatos for a lazy coffee or lunch. It’s always a good idea to bring water for your pooch. In fact, leave an extra bottle in the car, just in case. Be prepared to pick up and potentially pack out poop (pay attention for poop rules as they differ from place to place). If you see another hiker with a dog coming your way and they’re looking suspiciously at your canine BFF, don’t be shy about letting them know well ahead of time if your dog is friendly or not. This way you can both either relax or take control of your animals for harmlessly passing by on the trail. Keep Princess from charging ahead and pushing other hikers out of her way (i.e. don’t give hikers without dogs a reason to hate you and the rest of us). A few great hikes here, but I think you should amend this article to make it clear which trails clearly allow dogs off leash, and which ones require them to be on leash. On Sweeney Ridge, for example, we have received expensive citations from GGNRA rangers for having a dog off-leash, so I would definitely NOT rate this hike as one of the best in the Bay Area for dogs. Please take this hike off your list or add text warning people about this. Few dog owners want to take hikes where their dogs have to be on leash the whole time, it defeats the purpose of getting your dogs good exercise and enjoying the outdoors without having your dog straining at the leash. and great views for you? Thanks for the comment back. Actually off-leash areas aren’t that rare in the Bay Area. One of the hikes you mention, in fact, Wildcat Canyon, is an off-leash hike. But you don’t note anywhere above whether something is off- or on-leash, and it does make a world of difference, especially to young, active dogs who would disagree with a loud woof that there exists anyplace in the outdoors where they can be on-leash and still have fun. Pt. 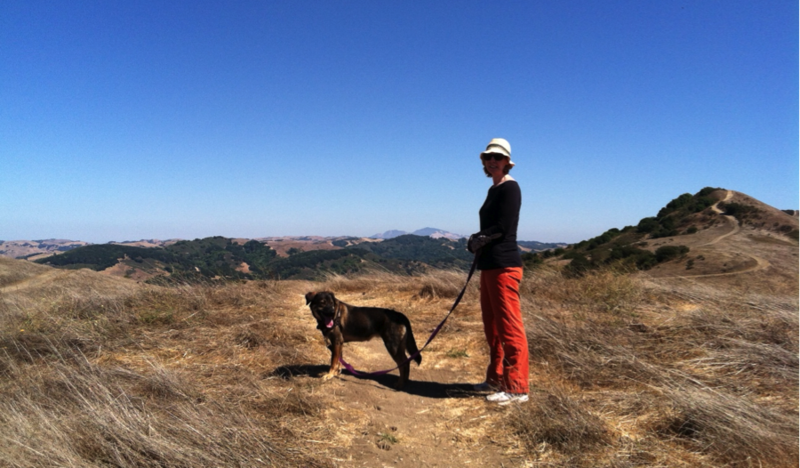 Isabel in the East Bay, of course, is a flat, easy hike and all off-leash. The two beaches, Crissy Field and Fort Funston, offer all off-leash, as do Las Trampas and other Regional Wilderness areas in the East Bay Regional Park District. My main point here is that information on hikes isn’t that useful to dog owners unless you have posted all of the specific leash rules. Del Valle Regional Park located about 10 miles south of Livermore has a great hiking area for dogs off leash. As a bonus, there is a lake where both you and your pooch can go for a swim to cool off. Just watch out for the rattlesnakes. Enjoy. I think many people do not realize that a good portion of Mt Tam which is under management by the Marin Municipal Water District does allow dogs on leash. I find these to be among the most beautiful hikes in the area. Jeff: These are absolutely great! I’m new to the Bay Area and these would have taken me months to find on my own. Thank you for posting. One of the best websites I’ve been using to take my dogs for a hike. Thank you Jeff. Please keep posting!! Jeff is also GREAT dog trainer, first hand experience. Thank you for this!!! We went to Sweeney Ridge for the first time today and loved it! Some good hikes, but unfortunately there’s not much info on them, like with many other sites. 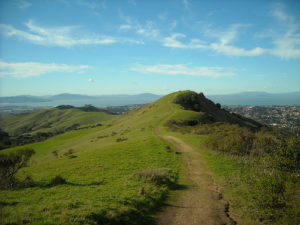 Check out http://www.HikesDogsLove.com for tons of Bay Area & Northern CA hikes with photos and detailed descriptions. Great hikes! Thank you for the recommendation. For on-leash vs off-leash options, I like to use http://baydoghikes.com. Very simple site but has links to trail maps where dogs are allowed. Check out Alltrails.com. You can filter hikes by dog-friendly trails. Great resource.